My quibble with Delirium is not necessarily rooted in my distaste for dystopias. Rather, my problem with the book is that I've read it before. In books like The Giver, Wither, and Matched - especially Matched. 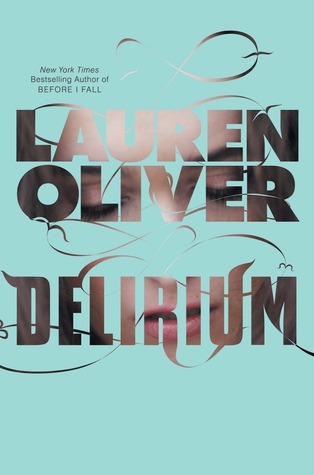 Delirium is arguably better written than other books I've read, but because I read it last, the originality is gone. Not that it's entirely unoriginal. Delirium has its own take on the dystopian love story plot. I love the concept of love as a disease that needs to be cured. Anyone who has been in the throes of new love can relate to the idea that it's a disease. The "cure" does not turn people into old, happy married couples comfortable in their affection. It turns people into sheep - walking in straight lines, going to work, getting married, having 1.5 children and not caring about any of it. So the world building is unique - although it follows the same framework as every other dystopia. But nothing about the plot surprised me. Girl basically content to abide by the rules meets boy who shocks her world; she falls in love, realizes the government she always trusted is awful, and seeks to either escape or change things. This is a loose summary of Delirium's plot, along with many other stories. While it's a well written version of the oft told tale, I was quickly bored. I knew what was going to happen and I didn't really care. I actually put the book down with 20-30 pages to go - at the most tense portion of the story and didn't pick it up for 3 weeks. And even then it was only because I figured I should finish it. Lena and Alex, our leading lady and man, are perfectly pleasant. Neither of them stand out from other young adult protagonists, but I liked them. Lena on the surface is someone who toes the dotted line, but as we get to know her (particularly through her friendship with Hanna), we learn that she's someone who likes to have fun and be a little mischievous. Most of all, she's different from the other teens her age. She likes "gray": the uncertainty, the risk, the potential. Alex is a great character. I loved his confidence. You'd think someone who lived with such high risk would be a little more cautious, but perhaps such personalities are the ones that can thrive in danger. Alex is the guy who has a response for everything - funny or serious when called for. He's the one you turn to when you're in trouble. A handsome, kind, reliable guy who seems to know all the answers. As I expected, Lauren's writing sets Delirium apart from others of its ilk. Present tense prose and short sentences ratchets up the emotion and tension. You can feel the growing love between Lena and Alex. Lauren focuses on the little things - the slightest touch or raised eyebrows - which turn into so much more. Depending on your style preference, the book may be a bit too heavy on the metaphors, but it struck the perfect balance for me between detailed description and trying too hard to sound literary. On the down side, such careful prose contributes to the book's slow pace. The focus was often on describing emotions and setting rather than moving the plot along. My favorite part about the book was the epigraphs at the beginning of each chapter. Lauren took traditional songs, nursery rhymes, and Bible verses and twisted it to fit her society's twisted rationale. It was a subtle shift that was done perfectly. It made the dystopic society feel much more real. Delirium wasn't quite for me, but I can see why so many people like it. The book is beautifully written, the characters ooze chemistry, and the world-building is rich and detailed. If this was the first dystopian love story I'd read, I'd probably be a huge fan. But since it was not, my affection was unfortunately spoiled. Aw, I'm really sorry you didn't enjoy it as much as you liked. I have actually reserved from my library as its on my TBR pile. I know there has been quite a lot of hype about this book for me. Hopefully I won't be disappointed. I have also reserved Matched at the same time, so it will be interesting to see the comparison between them. I read this one when it came out and I also wasn't completely blown away by it. There are so many similar stories that I just didn't completely fell in love with it.! Totally agree, the writing is beautiful but.. I had the same reaction to Delirium too and I haven't picked up book 2 yet because I'm really okay not knowing what happens next. I've already got my hunches. Actually, I liked Matched and thought it was well written. What bothered me about Delirium is that it only paid attention to one form of love-romantic love, but doesn't really talk or discuss the other types of love. The epigraphs were amazing ~ kind of genius how she managed to make so many work for her world. I waited a really long time to read Delirium because I just didn't think I would like it. It surprised me, I enjoyed it much more than expected. You give 3 stars to books that are not for you? I wish I was that generous! I didn't like this book at all. You are right, maybe after reading so many books like this one I was like... nah! But new readers will enjoy it. I found the love as a disease idea a very interesting way to see love. One of my problems with this book was the fact that I didn't really connect to Lena very well for some reason. I listened to this one audio and I am still waiting for the library to get in Pandemonium so I haven't listened to that one yet. Great honest review! I actually enjoyed the second one better than the first! Now, that's not to say I didn't enjoy the first one but it came out the same time as Matched and those two were so similar...meh. Too much, I guess. This was the first book I read by her and I totally agree about her writing. It's GORG! But yeah It's a bit sad when Dystopia takes the Same-Oh Route. :D Fabulous review! Nicely done. Ehh, yeah... I totally get why you would feel this way because I'm pretty sure if Delirium hadn't been among the first few dystopians I read almost two years ago, I would probably find it pretty unoriginal. I'm glad at least that you were able to enjoy Lauren's beautiful writing. I loved this one. I committed to a dystopia challenge and I've been reading a lot of them recently. I really think it comes down to the order that you read them which is kind of weird I think but it is what it is. I haven't read Wither but I know a lot of people that read that one first, hated it, then read Delirium and loved it. I'm reading Matched soon though. Well, even though it was predictable at times, I'm happy to hear that it is worth checking out. I felt similarly to Delirium now that I look back at it. At the time, I rated it highly, but it was one of the first dystopians I had read, and therefore, I loved it. But having read others now, I can see its faults. That said, it really set the stage for Pandemonium. I have a serious love for Pandemonium and she wrote it so well. I definitely recommend the follow-up.